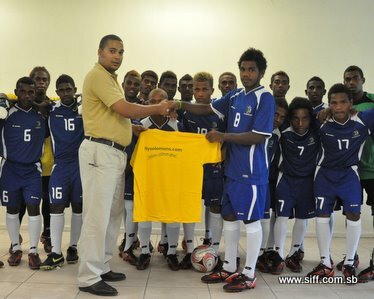 Last week the team received 3 sets of training t-shirts from Our Telekom, Solomon Airlines and local print and t-shirt company DJ Graphics in aid of their preparations for the Oceania Football Confederation (OFC) Men’s U-17 Championship in January next year. Marketing manager, Vivian Wickham, handed over the donation from Solomon Airlines which consisted of 23 training shirts to the team on Friday. Wickham said that his company has been supporting national teams for a number of years and is enthusiastic about once again stepping forward to assist the U-17 team. Wickham, who had previously travelled with some of the team members as junior national representatives encouraged the players to “work hard and maintain a high level of discipline” as they head towards the championship. “Results will come from hard work,” Wickham said. Both Our Telekom and DJ Graphics donated 26 t-shirts to the team. Head of Delegation, Phillip Ohoto’ona said that the team is very happy about the support that they have received from the 3 companies. “Morale in the camp has been boosted considerably by this donation and the team is grateful for this assistance,” Ohoto’ona said. The Katukatus will remain in camp during the Christmas period continue with their training. .